With Toyota signing up Gustav Brunner, the Japanese turned German constructor have achieved an enormous coup, enticing one of the most respected technical heads in the pitlane and providing serious impetus to their chance of making a respectable showing in 2002. Brunner has been offered serious money to move from Minardi before. Since he took the technical helm there for 1998, the pitlane at large has been frank in their admiration for the neat, cheap and effective cars that have come from the Faenza factory. Consequently, most of the tail-end teams have tried to buy his services, and all have failed. What makes Toyota different? It's an interesting question, and one that Arrows, Prost and Benetton, let alone Minardi, are all asking. Unusually for Formula One, the deciding factor did not simply boil down to remuneration. Although Toyota made an offer that few could refuse, the deal hinged on the team's design budget, and a post as head of the chassis design team, essentially giving Brunner a free hand in the development of the car. Having spent years developing his skills with teams like Arrows, Leyton House and Ferrari, before honing them on the Minardis, the opportunity put forward by Toyota is huge. Of course, Minardi's continuously precarious future, as they struggle to remain in the sport, provides some incentive to move, despite the involvement of Paul Stoddardt and his European Aviation backing. Private testing has demonstrated that Toyota is not yet ready to play with the big boys. Having scrapped the original V12 concept engine, the new V10 unit is coming on nicely. It is due two further significant evolutions this year alone, before being rebuilt from the ground up for 2002. On the other hand, whilst the chassis has a neat and very tidy aerodynamic concept, it is not very efficient. Feedback from the test drivers and Michelin tells the team they are lacking in front grip and will not be competitive unless they can sort it out. The back end does not set the world alight, but with Michelin rubber, it at least appears to be a respectable performer. In other words, there is plenty of work still to be done. On a different note, there have been unexpected failures � including the well publicised suspension failure which temporarily sidelined Mika Salo � in testing, demonstrating a weakness in product control that needs to be stemmed. Brunner's experience in overseeing production of reliable machinery, even under the most difficult of circumstances, is considered a key attraction to Toyota. The departure of Andre de Cortanze (Technical Director at Toyota Motorsport) is officially nothing to do with the test performance, but whispers indicate he was coming under increasing pressure to demonstrate a competitive car and was struggling to meet expectations. It increasingly appears that de Cortanze's departure was prompted when he was informed that a "renowned" technical expert would be joining the team, effectively taking responsibility for the chassis development. All is not plain sailing, however. Minardi were not expecting to lose the services of their Technical Director before the end of 2002 and believe he is locked into a water-tight contract. Unless Toyota can find a way to a mutual agreement over the terms of the termination, Minardi are fully expecting to take the case to court. Current opinion holds that Toyota are gambling on Minardi's tight budget to ensure the services of the designer. It seems they are considering payoff in the region of two million dollars for the contract; faced with a choice between solid cash income and expensive legal action in court for someone who no longer wishes to be part of the team, Minardi are expected to take the cash option. Despite the Ferrari protestations that Rubens Barrichello is safe in his seat, there is a lot of noise up and down the pitlane concerning private interviews, apparently for a Ferrari seat in the next two years. Rumours of Ferrari approaching David Coulthard have been in the air since Melbourne, but Coulthard is not the only driver being sounded out. Juan-Pablo Montoya and Jenson Button, despite both having water-tight contracts with Williams, have both been sounded out. Montoya has been vocal in his desire to remain at Williams, at least for the duration of his contract, and that makes sense. Despite the hype surrounding his arrival, his position is not yet secure and will not be until he can demonstrate the pace that Ralf Schumacher regularly gets out of the Williams chassis. His on track efforts, managing passes in impossible situations, puts a light in the eyes of both Frank Williams and Patrick Head, but that will not stop them making a decision to put in a more boring, but quicker driver. Therefore, being seen as shaky on loyalty so early in the season would not be the best move. Jenson Button, on the other hand, can only hope that Ferrari were serious, and that they would be able to buy out his Benetton and Williams contracts. That would be devilishly expensive, and given his age, Ferrari are more likely to go for cheaper talent and wait to see if Button can recover his rookie year form. His salary would be steep, but buying out Flavio Briatore is not funny. Giancarlo Fisichella, on the other hand, is coming under close scrutiny. Lambasted for poor performances last year, his summary dismissal of Button this year has brought him back into Ferrari's consideration. Should he continue his solid form, it appears that Ferrari want him on their side. There has already been serious talk of offering the Italian at least a testing "third driver" style contract, which would at least provide a route from the back of the grid, like those trod by Panis into BAR and de la Rosa to Jaguar, before him. 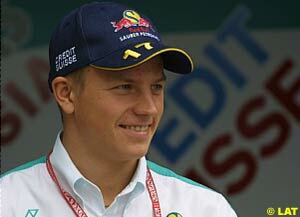 Having said which, the name most mentioned these days is that of Kimi Raikkonen. The youngster has repeatedly stated that he is not interested in a team as big and political as Ferrari � yet � and Sauber continue to deny the possibility, at least for 2002. The hype is certainly media generated, but it is infectious: the more Raikkonen does, the more the rumours grow. And until the Finn puts a foot wrong, they will continue to do so.